Colorado is a popular motorcycle destination and is known for its hospitality. Motorcyclists are rewarded with a boundless offering of roadside amenities. Yet, whether you are a resident of Colorado or just passing through, it is important to abide by all of Colorado laws. The motorcycle laws in Colorado are designed to protect riders as they travel through the state, and all motorcyclists must adhere to the same laws as other motor vehicles on the roadways. Click here for frequently asked questions regarding motorcycle accidents. Below you will find a comprehensive list of the riding laws and equipment regulations as they apply to Colorado. This information will help you safely and responsibly enjoy all the Centennial State has to offer- from twisting mountain passes to flower-filled meadows and everything in between. 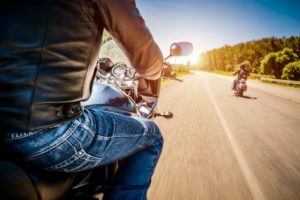 If you have been injured in a motorcycle accident anywhere in Colorado, you need an experienced attorney on your side. Contact the Colorado Springs motorcycle accident experts at the Green Law Firm today to schedule a no-obligation consultation and discuss your case. Call us today at 1-719-694-8515. We understand motorcyclist injuries and the complications that often arise after an accident.